INTRO: The little Behringer UCA202 has a rather loyal following and I’m not aware of anything that comes close for its bargain $29 price. I also was hoping it might make at least a decent USB headphone DAC. I love finding bargains that perform far better than their price would suggest! BEHRINGER TRIVIA: Behringer is an interesting company headquartered in Germany. People tend to be rather polarized in their love, or dislike, of Behringer. Most of the criticism seems related to Behringer charging much less for similar products than some of their competitors. They’ve been accused of copying more expensive designs, some say their gear is “junk”, and some are very happy with their Behringer products. For better or worse, Behringer has changed an entire industry. Before they came along, companies like Mackie had plenty of customers willing to pay premium prices for their gear. But then Behringer changed the status quo with similar products for a small fraction of the price. Mackie, for example was was forced to move their manufacturing to Asia, update their products, and radically drop their prices to stay in the game. The same has been true of other competitors. Today, not surprisingly, Behringer has a lot more reasonably priced competition. AN INTERESTING BEHRINGER STORY: Many years ago Behringer came out with what looked like a clone of a popular power amplifier used in recording studios—The Alesis RA300. And, at the time, the street price ($200) of the Behringer A500 was half the price of the $400 RA300. And similar amps by highly regarded companies like QSC, and Crown cost even more. Looking at the pictures here of both it’s easy to understand the clone accusations. So the Behringer A500 amp didn’t get much respect and was frequently attacked in the forums as sounding awful, being a cheap copy, and even a “joke”. Interestingly, however, the actual amplifier circuitry of the Behringer was very different than the Alesis so the clone accusations beyond the front panel were myth rather than fact. BEHRINGER VINDICATED: Here’s this supposedly awful sounding, made in China, bargain basement, pro amp considered “junk” by many. It’s about the last thing a true card-carrying audiophile would ever consider for their own system. So why not have a sense of humor and throw it under a bed sheet and use it in a $12,000+ system in a blind comparison against a seriously high-end audiophile approved wonder amp? And while you’re at it, you might as well drive it with a cheapo bottom-of-the-line Sony CD player—cheap DAC and all--and stack both on a rickety old chair instead of the usual $1000 sand filled audiophile equipment stand with floor spikes. And, just for good measure, use a $4 extra long tin-plated thin cable between the CD player and Behringer. Then have some volunteers stand behind the speakers and swap the cable plugs back and forth at the request of the card-carrying audiophiles doing the listening. WHY IT MATTERS: Behringer has shown across their product line that you don’t have to spend lots of money to get great performance. Tests of Behringer, and similar gear from other manufactures, have also proven supposed high end companies are often selling mostly hype rather than genuinely better sound or performance. In a few areas (such as speakers) spending more gets you better sound. But in most product areas, once you reach a certain point of diminishing returns, spending more just gets a you a higher-end brand name, sometimes nicer looks, and a lot less money to spend on other things. And if you don’t like using a pro-sound company for this analogy, there are plenty of home audio ones as well—such as Emotiva. Their gear can stand up to just about anything comparable at any price in terms of both measurements and blind listening tests. You really can have your cake and eat it too sometimes. HOW CAN BEHRINGER DO IT? Behringer’s large size and high volume gives them a big advantage. The DAC chip in the UCA202 sells for about $6 just by itself—and that’s if you buy 2000 at a time. That’s what some little boutique audiophile USB DAC manufacture would have to pay. But Behringer likely buys a zillion of them and pays much less. They have in-house specialized design talent shared across their diverse products for everything from circuit board layout to injection molded enclosures. And they have strong manufacturing capability in China. So their total costs are a fraction of what a specialty audiophile manufacture would pay to make the exact same thing. IS THE UCA202 JUNK? I’m sure some of the more esoteric forums that discuss DACs (with some costing thousands of dollars) would largely dismiss the UCA202 as “junk”--just like those who dismissed the Behringer A500 amp above. It might be cheaper than two 3D movie tickets, but is it really junk? It’s USB powered, features an optical output, RCA Line inputs/outputs, a 3.5mm headphone jack and even a headphone volume control. WHAT ABOUT THE UCA222? (revised 2/28/11) Behringer has a newer version of the UCA202 called the UCA222. I don’t have one, but as far as I can tell, it’s the 202 with some DSP effects likely added to a proprietary driver. This could be bad news if it’s no longer true “plug-n-play” like the UCA202 is. And the proprietary driver may not be “bit accurate” (totally transparent) even with all the DSP functions disabled. On the other hand, if you want to mess around with sound processing and effects, then it might be a cheap way to experiment before spending big bucks on a more capable effects processor. And if it will work without the Behringer driver it may well perform similar to the UCA202. THE UCA202 AND WINDOWS: I’ve plugged my UCA202 into several PC’s of various vintages and configurations. They include an ancient laptop running XP, my Core 2 Duo lab system, a Vista machine, and a 64 bit Win 7 Core i7 system. It always auto-installed without so much as a single mouse click. No buggy drivers required. It shows up in Windows as a generic “USB Audio CODEC”. If you run Linux or OS X, your results may vary. SUBJECTIVE LISTENING: First I hooked it into my “big rig” via the line outputs and played some favorite tracks using Foobar 2K and listened over my reference speakers and assorted headphones on my Benchmark DAC1 Pre. The UCA202 sounded good. 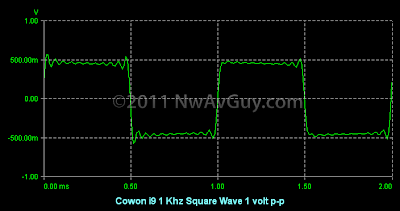 In fact, the line outputs sounded rather similar to the DAC1 Pre doing the D/A work. The UCA202 was quiet and never had any obvious distortion or sonic flaws. Moving to the headphone output, things were not as simple. With 16 ohm headphones it sounded noticeably different than the Benchmark and it wouldn’t get very loud. But with higher impedance efficient headphones it still sounded decent. With my uber-efficient UE SuperFi 5 Pro’s there was only readily audible hiss at the top 20% or so of the volume control’s range but the frequency response had obvious problems due to impedance issues. With more typical headphones the hiss was inaudible, or barely audible, at any setting. MEASUREMENT SUMMARY: In most ways, especially via the line outputs, the UCA202 performs respectably well. The headphone output, however, has a 50 ohm output impedance. Behringer likely intended using professional large headphones of the sort often used for studio and monitoring work (they are, after all, a pro-sound company). Most of these headphones are 80 – 600 ohms and would work reasonably well with the Behringer depending on how loud you want to listen and their sensitivity. But with typical 16 to 32 ohm portable headphones, it’s a different story. Here the UCA202 struggles. And with most balanced armature style IEMs, the frequency response will no longer be even close to flat due to the impedance interaction (see: Headphone & Amp Impedance). BOTTOM LINE: If you your PC has marginal line outputs to feed an outboard sound system, amp, use for measurements, etc., the UCA202 is a bargain and offers significantly better performance than most built-in sound hardware. It also makes a good second interface (Windows 7 lets you assign different software/sounds to different interfaces). It’s especially useful for laptops that often have inferior sound hardware and often no line inputs or outputs at all. So if you’re not looking for a high-end solution, the UCA202 might fill the need and save you some serious money. If you want a headphone amp, and happen to have some 80 – 600 ohm fairly efficient headphones, the UCA202 is also worth considering. The headphone amp mostly measures very well, offers excellent channel balance, and has reasonably low noise. The only real downsides are the output impedance and power. If these are not a problem for your application, it might be an ideal solution. You could also use the line outputs to drive a dedicated analog headphone amp. UCA202 INTERNALS: The UCA202 uses a highly integrated Burr Brown/TI PCM29xx CODEC chip. As mentioned earlier, they’re nearly $6 each in 2000 piece quantities. With most everything integrated into a single chip, it makes the implementation harder to screw up. The chip has a delta-sigma DAC, oversampling digital filter, and is rated for 93 dB of dynamic range and 0.005% THD+N. The PCM2902 Datasheet has more info. A classic 4558 op-amp is the headphone amp and another pair of op-amps handle line in/out duties. The power supply looks to be reasonably well filtered. The pictures show it’s not a made-in-California HRT Music Streamer DAC, but it’s a clean layout and you can buy 5 of these for the $150 price of HRT’s least expensive model. Nobody will think the plastic case is “high-end” but as long as it doesn’t fall apart, what matters most is how it performs and how it sounds. And here, so far, things look OK.
A 0.008% THD measurement is very respectable while playing back the “loudest” digital signal possible (0 dBFS) and pushing the line output amps to their limit. The noise profile is interesting. 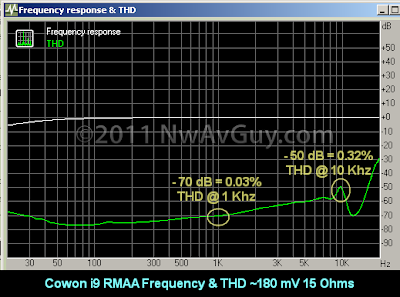 Starting at around 25 Khz (well above what’s audible) the noise climbs steadily up to about –80 dB at 70 Khz. This is something I’d never seen in RMAA measurements of the UCA202 because they rarely show anything past 20 Khz. 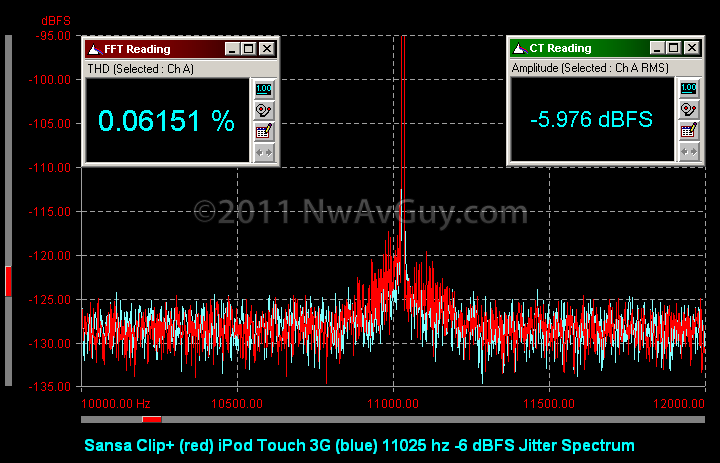 NOISE SHAPING: It may look bad, but that big ultrasonic bump is likely what’s known as Noise Shaping. Designers intentionally push the noise from the D/A conversion above the audible band to improve the audible signal-to-noise ratio and that’s likely what’s happened here. It’s worth noting many devices have much louder distortion products in the audible range and this is well above the audible range. I think it’s safe to say the ultrasonic bump is inaudible and better than more noise and distortion below 20 Khz where you can hear things. Behringer could have filtered more of this out, but the filter itself might have had a negative effect on performance in the audible range so this is likely a good trade-off. 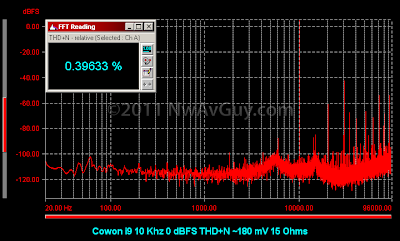 The un-weighted noise up to 22 Khz is about –88 dB from the reference level in the previous screenshot. And the A-weighted noise (the “dBA” spec you often see published) accounts for human hearing sensitivity and is about –92 dB. These are not amazing numbers but certainly respectable—especially for a device running from famously noisy USB power. And as indicated in the subjective comments earlier, the resulting slight hiss can be audible under some conditions but typically isn’t a problem. OK, so the line outs look good, but what about the headphone outputs? 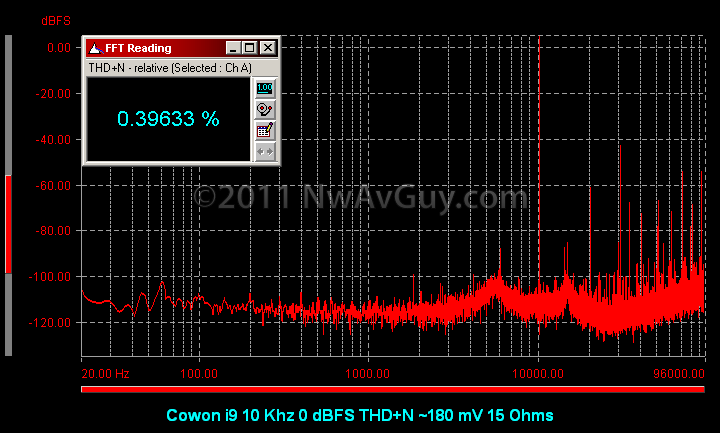 Amazingly enough, the THD+N here is actually lower than the Line Outs! That’s likely because the 1.1 volt RMS (3.1 v p-p) line output is stressing the line-out amplifier a bit while the 0.4 volt signal here is a piece of cake on a 5 volt power supply. 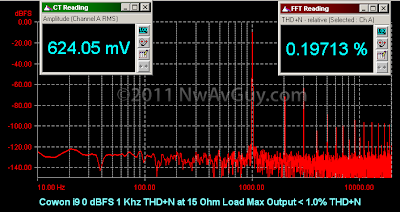 Also note the load is 150 ohms, not the more typical 15 ohms I have used testing portable players. More on that in a bit. The volume control on the UCA202 was adjusted here to deliver a reasonable reference level for 150 ohms. With the typical studio headphones Behringer intended, 400 mV RMS of output would be a decent listening level. The noise floor in the audible band is impressively clean. It’s actually a bit over 1% THD+N here but it’s close enough. 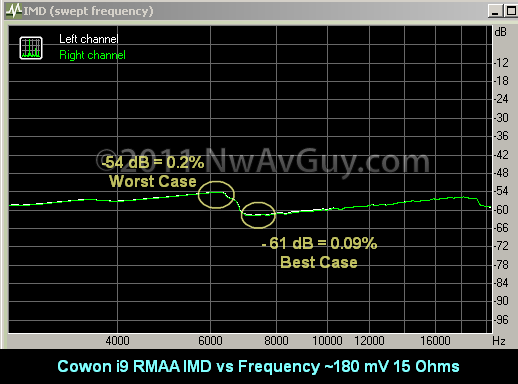 I used this level because it’s the same 1 mW/32 ohm reference voltage I’ve used for testing other devices. Into 16 ohm headphones, the UCA202 will only manage about 179 mV or 2 mW. The Clip+ is much better at about 11.5 mW. This is a significant difference and it’s a big reason why the UCA202 isn’t an ideal headphone amp for typical low impedance portable headphones. As I reported in the subjective tests, the UCA202 didn’t get loud enough with some of my headphones. I also reported it sounded odd with other types. This is related to the output impedance of the UCA202. 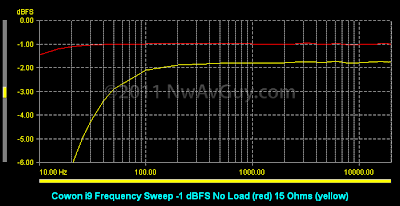 The no load voltage is 530 mV and with 150 ohms it was 403 mV. 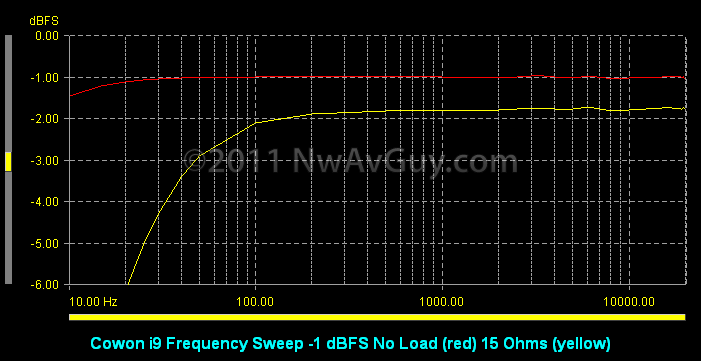 Do the math and you get an output impedance of 47 ohms—close to the Behringer spec of 50 ohms. The good news is this will work OK with many full size efficient 80 - 600 ohm studio-type cans. 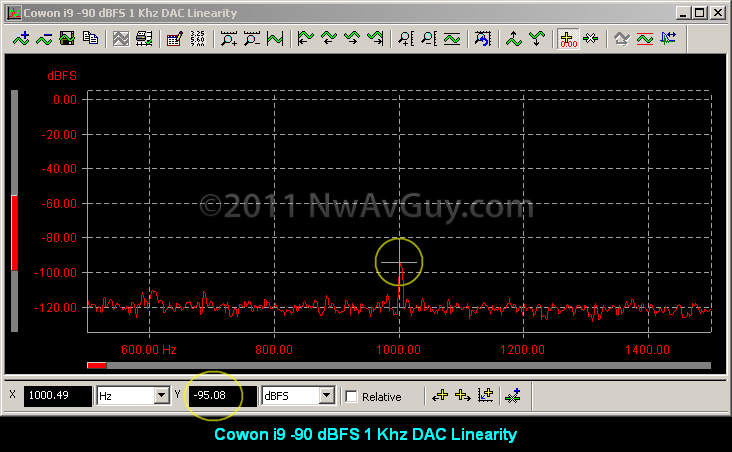 But, as already indicated, the UCA202 isn’t a good match for low impedance loads. 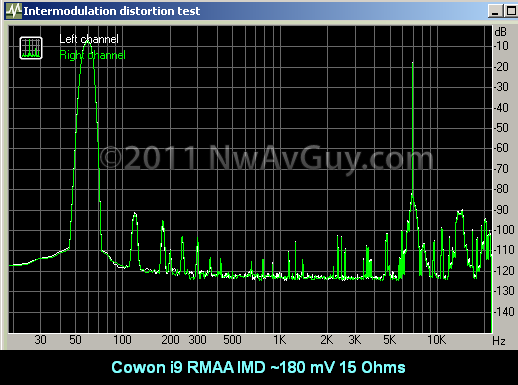 That’s why most of the tests here are into 150 ohms. 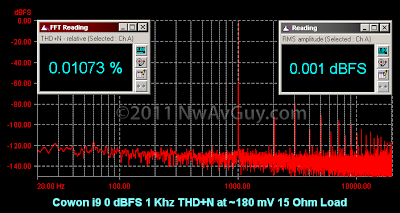 The UCA202 does impressively well staying well around 0.015% up to nearly 10 Khz when the THD+N starts rising but it’s still at a very respectable 0.1% even at 20 Khz. Note the distortion is calculated here “on the fly” with the frequency sweep versus the spectrum 1 Khz plots above that are done with a more detailed (and slower) FFT result--that’s why the 1 Khz number here is slightly higher. 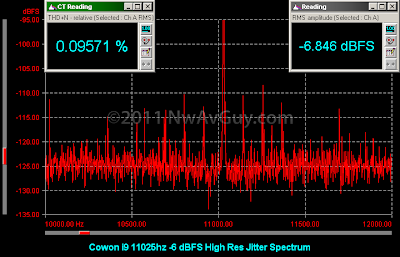 And the “stair steps” above 10 Khz are due to the way the 22 Khz cut-off frequency interacts with the distortion calculation. 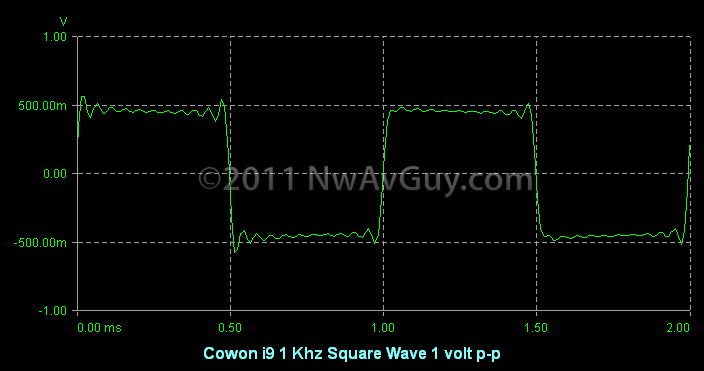 The sidebands are limited to just a couple spikes at –100 dB or lower. Overall this is very respectable performance for any DAC let alone the loaded headphone output of one costing $29. 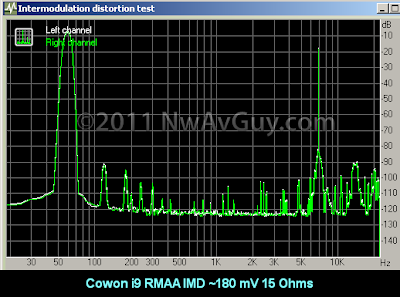 Note it’s dead flat all the way down to 10 hz, the channels are very closely matched, and the response is about –0.25 dB even at 20 Khz. 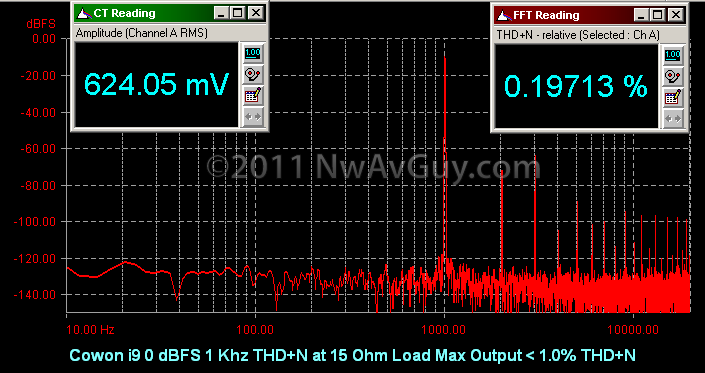 Again, this is very good performance but in this case it’s helped out by the relatively easy 150 ohm load. 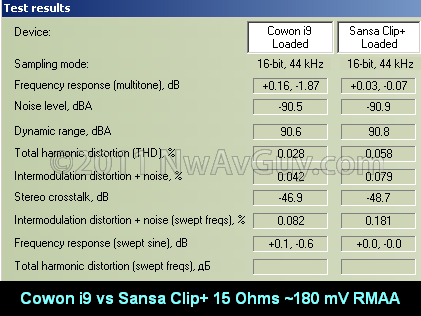 There is some low frequency roll off into lower impedances. With the Benchmark there is less spread, virtually no sidebands, and the DAC1, as expected, has a significantly lower noise floor as well. I’ve also included a pitch measurement as part of this test. The dScope has a very accurate internal timebase so the 11025 hz input signal should (and nearly always will be) reproduced at 11025 hz plus or minus a small fraction of a hertz. 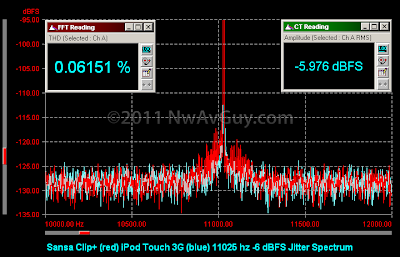 The Clip+ was a notable exception with a 0.25% pitch error (that’s corrected by the Rockbox firmware). The UCA202 is fine. There’s nothing much to complain about here. This is a fairly typical result that compares well to even much higher-end products. 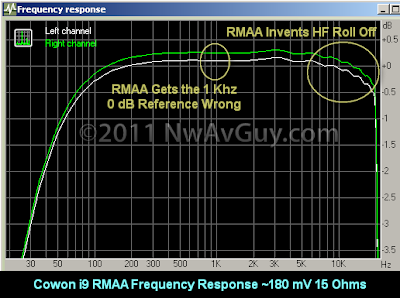 The separation above 100 hz (below that frequencies are largely non-directional anyway) ranges from a worst case –50 dB up to nearly –75 dB around 3 Khz. This is far better performance than I expected from such a small inexpensive device and more than enough for most any application. But, like the frequency response, it’s helped out by the relatively easy 150 ohm load. VOLUME CONTROL AND CHANNEL BALANCE: Analog volume controls, like the cheap little potentiometer in the UCA202, have isolated sections for each stereo audio channel. And it’s difficult, and expensive, to make these two sections match perfectly. So as you adjust the control, the actual settings for the right and left channels can be different from each other. How much tracking error you get depends not only on the control itself, but also its relative resistance to the rest of the circuit. A good circuit design helps minimize the errors. If you want to know how soft a 45 dB drop is, try adjusting the level on a piece of audio gear that has a calibrated volume control to a comfortable level and then lower it 45 dB from there. If you have a portable player with Rockbox, you can do this with Settings > Sound > Volume. The above is likely lower than most people would listen at but it depends on the efficiency of your headphones. 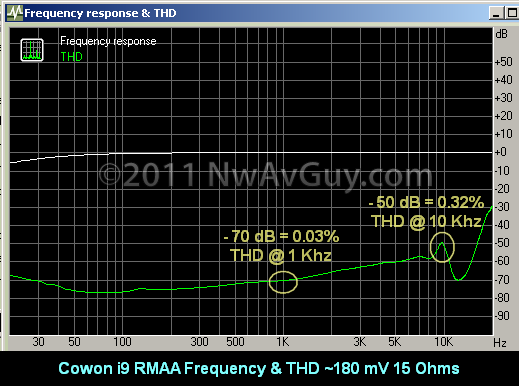 If your headphones are 10 dB more efficient than average, –45 dB becomes –35 dB. Here the UCA202 has a slightly audible error of 2 dB but this is still an impressive result for what has to be a really inexpensive volume control in a $29 USB DAC. MEASUREMENT SUMMARY: As stated in the Bottom Line section earlier, the Behringer UCA202 line outputs measure very well even for a more expensive DAC. So if you need line outputs, or want to use them to drive a headphone amp, the UCA202 might be a great deal. The headphone output, on the other hand, works best with fairly efficient high impedance professional or studio-type headphones (with an impedance in the 80 – 600 ohm range). For typical 16 – 32 ohm headphones you probably won’t be that happy unless they’re really efficient or you like to listen at low levels. There may also be some significant frequency response variations due to the impedance—especially with balanced armature IEMs. Still, the UCA202 is so cheap, it doesn’t cost much to find out if it will meet your needs? UCA202 MODIFICATIONS: (revised 3/15/11) The only thing keeping the UCA202 from being a respectable headphone DAC is the ~50 ohm output impedance and limited level into low impedances. By replacing a few parts the UCA202 can be upgraded to a much higher quality headphone output for less than $5 worth of parts. 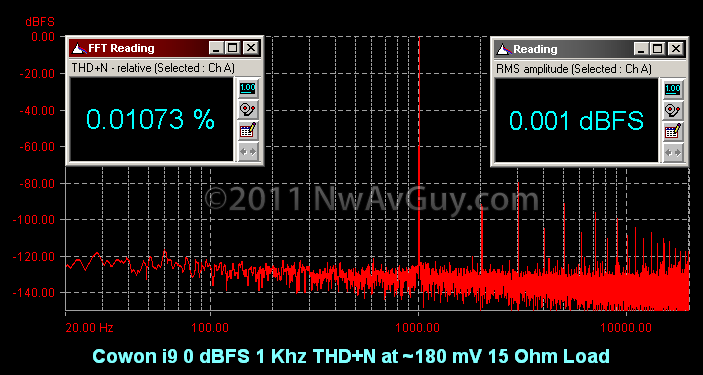 See how that experiment turned out in the Modified DAC article. INTRO: I liked the Sansa Clip+ so much I was curious about its bigger brother: The Fuze. The word on the web is the Fuze has similar performance to the Clip+ and it has several advantages. And the newer Fuze+ is getting some negative reviews, so I wanted to grab an original Fuze before they're all gone. I purchased a black 4 GB version for $50. The screen is bigger, easier to read, in color, and can show more information like more of the artist/song information, album art, etc. The bigger screen is especially an advantage with Rockbox as it can display all sorts of cool things. The controls are larger and easier to use. The buttons are more spread out on the Fuze and it has a rubberized rotating "wheel" which makes navigating the menus, adjusting the volume, etc. quicker. You can take your pictures with you and display them on the Fuze. The Fuze looks and feels more substantial. The back is “rubberized” which makes it feel better in your hand. It’s much thinner than the Clip+ which makes it seem more sleek and expensive. I’m not sure many take advantage of it, but the “dock-style” connector at the base of the Clip+ allows it to be used in Sansa-compatible devices like portable speakers, etc. There are line outputs available in the connector. It’s bigger, heavier, and especially wider. It’s more noticeable in a pocket. You can’t clip it directly to your shirt sleeve, pocket, etc. It uses a proprietary Sansa “dock” connector (the same as the e200 series) vs a standard mini USB jack on the Clip+. This means you need a special cable for charging and syncing the Fuze but not the Clip. It’s been discontinued and will eventually be hard to find at stores. IMPRESSIONS: It’s a nice player—certainly one that seems like it should cost more than $50. It’s sleeker than the much thicker and harder to hold Clip+. There are some extra screen animations and graphics, plus the wheel, but the user interface, menus, etc. are mostly very similar to the ones on the Clip+. The Clip+ has volume up/down buttons on the side and the Fuze uses the wheel instead. Both players also run Rockbox firmware in similar ways but the bigger screen on the Fuze is a huge advantage here. Listening to the Fuze it sounds the same, to my ears, as the Clip+. SANDISK GOING BACKWARDS: I haven’t personally used or tested one, but judging by the reviews on Amazon, the forums, and elsewhere, the “new and improved” Sansa Fuze+ is mostly a step backwards. They updated the shape, look and controls to try and chase Apple, but if what I’ve read is true, it’s harder to use, slower, and doesn’t have as impressive of audio performance. Several people have said they got rid of their Fuze+ in favor of the older original. I also fear this may happen when they replace or update the Clip+ as well but perhaps they’ll learn from their mistakes with the Fuze+? BOTTOM LINE: If some of the advantages of the Fuze over the Clip+ are appealing, you might want to consider getting one soon before they’re sold out. I wouldn’t be surprised, if like the previous 5th generation iPod Nano, the Fuze ends up selling for more on eBay than they sold for new in the stores. Apple, in their quest for ever smaller/thinner/sleeker body jewelry, once again chose form over function and removed the video camera from the 6th generation Nano. That’s created a strong secondary market for the previous generation with factory sealed Nano 5G’s bringing higher prices than they did new. If you already have a Fuze and love it, you might want to consider buying a spare. MISC DETAILS (edit 2/24/11): My Fuze is running V02.03.33A firmware. And I’ve been informed by one of the Rockbox developers on Anything But iPod the Fuze V2 (i.e. like the one I tested) uses different hardware than the Fuze V1. So your mileage may vary if you have the earlier version.